Microplastics are plastics that are smaller than 5 millimeters. These small bits of plastic are detrimental to sea life, causing physical and metabolic damage when ingested. Non biodegradable, these plastic particles can persist out in the surface waters of the world’s oceans for years. 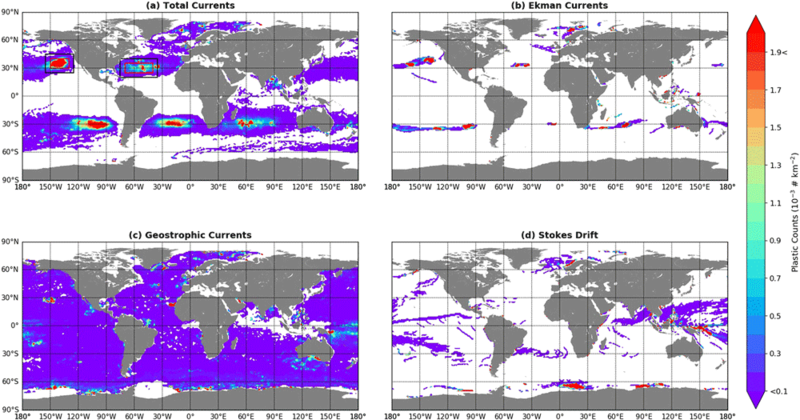 A recent publication in JGR Oceans took a look at how the physical processes, such as surface Ekman and geostrophic currents, surface Stokes drift, and mesoscale eddy activity, affect the distribution of micro plastics around the world. The study sought to understand which processes have the greatest influence on how micros plastics drift across the oceans. The study corroborated past research that shows that wind-driven surface currents called Ekman currents are responsible for the presence of floating microplastic concentrations at the surface in the subtropical ocean gyres. The study further found that geostrophic currents and Stokes drift don’t contribute much to the large‐scale accumulation of microplastics in the subtropics. More significantly, the study found that Stokes drift is responsible for pushing microplastics to the Arctic Region. The authors of the study stress that the lack of consistent inclusion of Stokes drift in microplastic transport modeling means that “microplastic contamination of Arctic regions might be more severe than currently expected”.